The Long Earth is an outstanding novel; entertaining with some great touches and a unique story that has Pratchett's touch of genius about it - combined with Baxter's hard-scifi edge and world building skill. All the ideas and the vast scope of the story carried the book forward really well but it seems that magic hasn't quite survived intact on the journey to the second novel. There is always a danger with having two such different authors working together that one will shout louder than the other, the balance of the last novel was spot on but here it seems a little too strongly biased to Baxter's voice in places. There isn't anything wrong with Baxter's writing but if you are reading a novel featuring Pratchett (who to me is one of the finest writers alive today) you want to hear Pratchett's voice; smile at his cutting wit and be drawn into his friendly, easy prose. Instead Baxter seems to dominate for much of the novel (certainly in the first third of the book) and in my opinion it does suffer as a result. It lacks that friendly, easy-reading touch at times and seemed to take ages to actually get going which is a shame as it is a worth-while read once it gets going. The story itself feels a little like they have run out of steam in places, like they've lost the direction they should travel and a large part of the book seems to meander between empty worlds while bemoaning the brutality of man - the Trolls used as a device to explore sentience, racism and the casual cruelty of those who see something inferior. It is quite well contained though, following individual story arcs for the most part and imaginative with some great ideas once on track, as with the slow start its worth persevering with. There are some good touches, references abound to Pratchett's Discworld series such as a pub called "The Mended Drum" and Lobsang's appearance bearing a remarkable resemblance to the history monks. Lobsang makes an excellent character, an increasingly intelligent, enigmatic AI who's connections to the "Black Corps" organisation still leaves us guessing (as does the seemingly over-generous organisation itself). Having said that you really shouldn't explore this book looking for a Discworld story, it isn't anything like it (it isn't supposed to be either) but for all it's niggles it is an enjoyable adventure. 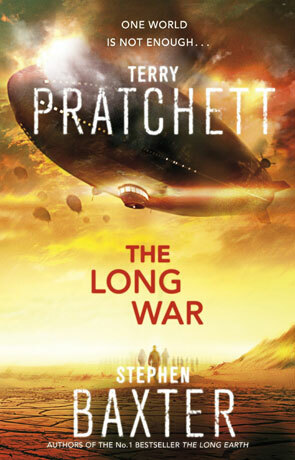 The Long War will appeal more to fans of Stephen Baxter or science fiction in general than it will fans of Pratchett; there is that feeling of a grand scale, of epic events to be unfolded in the future and to be fair the book does pays off in the end but the journey isn't as smooth as it could be. Written on 27th August 2013 by Ant.